Jodtabletten prescriptions are currently not available via our online consultation service. You can, however, request an online consultation for thyroid problems. For whom are iodine tablets intended? What effect do Iodine pills have? How should you take the iodine tablets? How do you determine the dosage and duration of your course of treatment? Jodine pills are intended for people who are exposed to radioactive iodine. People who live within a radius of 20 kilometres from a nuclear plant are able to collect the iodine pills from a pharmacist free of charge. These people can also stock up on the pills as a preventative measure. However, in the event of an emergency at a nuclear plant, 20 kilometres is not far enough. The range of a radioactive cloud resulting from a nuclear disaster is many times further. Imported fruit and groundwater can be contaminated with radioactive particles. These people are not prepared for these types of disasters. In a nuclear disaster, such as the one in Japan, radioactive iodine is released. This radioactive iodine can enter our bloodstream via our airways, our skin or by eating contaminated food. The thyroid gland stores this radioactive iodine. Through the continuous irradiation of this important organ, the risk of cancer and other disorders involving the thyroid gland increases exponentially. Especially babies, foetuses and young children are at a higher risk. The thyroid gland is unable to distinguish between "normal" iodine and radioactive iodine. By saturating the thyroid gland with iodine from iodine pills, the thyroid gland is unable to absorb any harmful radioactive iodine. The radioactive iodine particles will then be removed from your body with your faeces. It is best to dissolve the iodine tablets in a glass of tepid water. The iodine tablets do not dissolve easily. It is therefore best to break them into small pieces and stir them in the glass. For administration to a baby, you dissolve the indicated dose in a feeding bottle. The instructions enable you to determine the correct dose of iodine tablets for each member of the family. You must, of course, remain indoors at all times. Keep windows and doors closed to prevent exposure to radioactive particles. Listen to or watch the news on the radio and television and follow any recommendations. 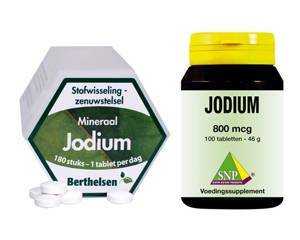 Dokteronline.com will do its very best to deliver Iodine Complex (180 tablets) to you as quickly as possible.